Forgive me, I have been crying. Today I wept while driving, when I saw an old couple hug on the sidewalk. I wiped my cheeks as I watched the post office clerk weigh my letter and add up the international postage for my letter of condolence to an old and dear friend. 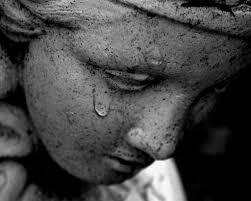 Tears come easily and publicly these days, and that is not like me. I hardly ever weep for my family. I don't mean to imply that I have never shed tears for those I love, of course I have. But for the most part, after all these years, I do not generally weep for members of my own family. When problems arise on the home front, I tend to make lists and phone calls; my husband reminds not to grind my teeth. Last week I received terrible news. The 19 year old son of a very old and dear friend passed away in his sleep. This was a healthy young athlete who had just finished his first year of pre-med university studies. As my sister said, there are some deaths that affect you more than others. I have known my friend since we were babies in playpens on the beach at the cottage. Our parents and grandparents were friends. The loss of this vibrant, sweet young man has made me so, so sad. A couple of nights later, I had dinner with two women friends. One of them apologised as she set her cell phone beside her table mat. "My mother is dying. She became bed-ridden with Alzheimer's about ten years ago and now, well, it's the end." The phone didn't ring during dinner, but we departed after dinner without delay. Two days later, I received a message that my friend's mother had passed away. I have been thinking about loss, specifically the loss of someone who is dearly loved. How can the loss of a child ever be borne? I have thought a great deal about that question the many times that we nearly lost our Nicholas. But each time he bounces back, I lose my grasp on dealing with the reality of losing him. There have been a couple of times over the past year when I thought about my mother's demise. I thought, "Well, it's time. She's had a good life." But then I remember it's my Mom I'm talking about. What would I do without her? I know from my Dad's death that we need our parents to hold us in their arms the most during the moments and days after we bury them. I know that the shock of our friend's young life lost will ease and I be able to observe a white haired mother embrace her son or daughter in the street without catching my breath and feeling tears on my cheeks. Of course, grief is the proper response to loss of life. But I know that each grief is individual and provides no practice at all for the next one. Today, I visited my Nick in his care home and I hugged him. I phoned my Mom and left a message. "I love you, Mom", I said. It's the best I can do. This is a lovely piece, thank you so much for sharing! I am so sorry for the loss of your friend's son. I think you are right that a death is not less painful because it was expected or because the person was old, or whatever the circumstance may be. Sometimes death is a good reminder of how much we value those in our lives. I send you hugs! I had to read this when I saw the post on FB. It grabbed my attention bc I am not a crier, but lately I've cried in public (grocery store checkout to be specific). The occasion for my public display was a huge letting go moment as a special needs mom and caregiver. I had finally taken advantage of respite, and I felt tremendous guilt and sadness - that I had a child who needed respite. I know crying gives us an emotional release, and is important. It comes to me when I've been a rock and my body knows it needs to release all the pent up stress, emotion, etc. I prefer to do it in private in my car or shower though. Thank you for sharing Donna. My heart goes out to you and I send you a very gentle and warm cyber hug. I was thinking about this habit we have of being so well defended and then the times when we are released - when we give ourselves permission (sometimes unconsciously) to experience emotions. They come in a flood and often they take us be surprise. The image I have in my head is of memory foam all pressed down in a compressed package, suddenly cut open to expand all over the place.